Trending at $4.78Trending price is based on prices over last 90 days. Moto Racer 2 (PC, 1998) Disc Only. Great motorcycle race game from the past!!! Moto Racer 2 (PlayStation PS1) Features 32 Courses Across Five Exotic Locales! 2 product ratings - Moto Racer 2 (PlayStation PS1) Features 32 Courses Across Five Exotic Locales! 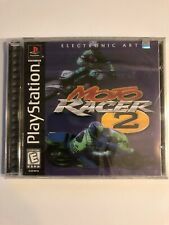 Moto Racer 2 PlayStation 1 Game! Disc Only Excellent! Free Shipping! 2 product ratings - Moto Racer 2 PlayStation 1 Game! Disc Only Excellent! Free Shipping!